Netra Basti nourishing ghee eye bath therapy is used for a wide variety of eye ailments. We recommend this therapy if you are experiencing eye strain from long hours online, if you would like to improve your vision, or pacify the doshas in the head area. Before your Netra Basti begins, we start by massaging your face and scalp to encourage release of tension in the head region. Next, we apply the Netra Basti, the traditional Ayurvedic eye treatment involving bathing the eyes in plain or medicated ghee. The ghee is retained within a dam made of dough for approximately 15 minutes on each side. This is a specialized Ayurvedic treatment for the eyes and nervous system. Other benefits include: removes wrinkles, brings luster to eye and face, improves memory and other mental functions, reduces physical tension and emotional release. Before the Heart Basti is applied, your treatment will begin with massage to the chest, neck and head areas. Heart Basti therapy involves warm, herbal oil applied to your chest for up to 30 minutes. The oil is contained within a dough dam over the heart area. This basti can nourish, strengthen, balance heart functions, and rejuvenate the heart. Guided visualization and mantra therapy deepen the experience of Heart Basti. If you would like to open your precious heart and nurture your emotional center, this is the Basti for you. Kati Basti is a therapeutic oil treatment given to assist in relieving tensions of the lower back. In this treatment, a dough dam, filled with warm herbal oil, is applied to the area for a period of time. Before and after the treatment, specific marma points around the affected area will be massaged, followed by localized steam to deepen the effect. If you want to relieve tension to the lower back caused from sitting for prolonged periods I recommend this therapy. All Bastis are: $115 for 60 minutes and can also be added on to other treatments. Svedana is traditionally administered after one receives Abhyanga massage. 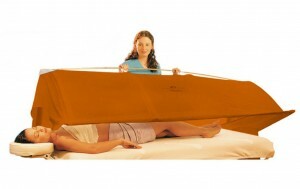 A steam tent is placed over the massage table whereby herbal or aromatherapy steam enters the tent to further loosen impurities and detoxify the body. Other benefits include: improvement in luster and circulation, weight loss, eases sore muscles, relieves stress and rejuvenates the skin. Potent essential oils are applied along the spine to reset the immune & nervous systems and realign energy centers. Profoundly relaxing.